Home > Sustainable Living > What is Sustainable Education? Education is key to developing a sustainable community, economy and social system. In order to support a sustainable environment, each individual must be responsible for their own actions and understand how these actions affect the environment. If people are not even aware of issues surrounding the environment, they cannot be expected to take the environmental impact of their behaviour seriously. Between 1998 and 2003 the Government operated a 'Sustainable Development Education Panel' whose final findings are being followed up by the Department for Education and Skills (DfES) and the Department for Environment, Food and Rural Affairs (DEFRA). Whilst the Higher Education Funding Council for England (HEFCE) have pledged to put higher education at the forefront of national environmental policy, Primary and Secondary education is seen to provide the bedrock on which a sustainable education system can be built. Following the panels findings the U.K. government proposed that every school should not only teach the importance of respecting the environment, but should also operate a practical working sustainable policy. Currently, new school buildings are encouraged to be built using sustainable methods, whilst there are grants and subsidies available to help schools modify old buildings. Sustainability is taught across the national curriculum and can fit into the teaching requirements of any subject. The dual approach of having schools literally run using sustainable methods, whilst teaching pupils about sustainability enables pupils to see directly the benefits of leading a sustainable lifestyle. If this is seen to be positive, it follows that the individual pupil will carry a sustainable attitude towards the environment outside the school environment. Two major ways in which pupils can see the benefits of sustainable living are in changes to diet and transport. By making arrangements for pupils to take public transport, engage car-sharing schemes, walk or cycle to school, sustainability is actively encouraged without even imparting any 'lesson' of such. If pupils can be made to see the environmental and health benefits of such initiatives, ingraining such activity as part of a daily routine will be achieved more easily than by 'rote' style learning. The government, local authorities, broadcasting companies and the media all have a valuable role to play in the continuing education of the public regarding sustainable issues. Most of this activity is filtered down as a result of action taken by the government, pressure groups or conscientious individuals: The government are under pressure to reach environmental targets under E.U. and U.N. law; pressure groups encourage steps to reach and overstep these targets, whilst individuals in the media and on local authorities push for the publication and transmission of pro-sustainability material. However hard the U.N, E.U. and U.K. governing bodies push for the implementation of environmentally sustainable policies, the communication and application of information on sustainability cannot occur at any point along the line without the co-operation of environmentally aware individuals. 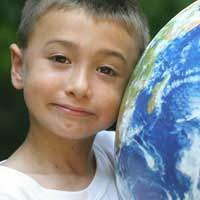 A firm grounding in environmental issues from an early age will be essential to providing a community of responsible and aware adults, capable of taking the U.K. and world towards a safer and healthier environment.